What’s to like, or not, about this newsletter? Give us your thoughts about Georgia Wild and we'll put your name in the hat for a DNR cap. It all starts with our annual reader survey. 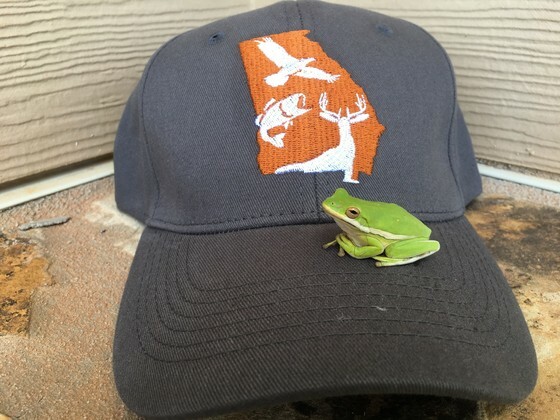 Take the survey, add your email – it’s one of the questions – and you will be entered in a drawing for a Wildlife Resources Division hat (sorry, treefrog not included). Impress your friends and help improve Georgia Wild. You and wildlife win. 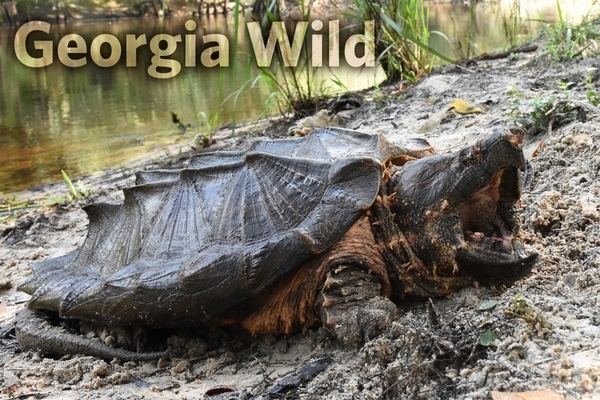 Georgia’s Little River is home to some big turtles. Some very big turtles. So is the Withlacoochee, the Alapaha and those other lazy, dark-water south Georgia rivers that feed the Suwannee River. 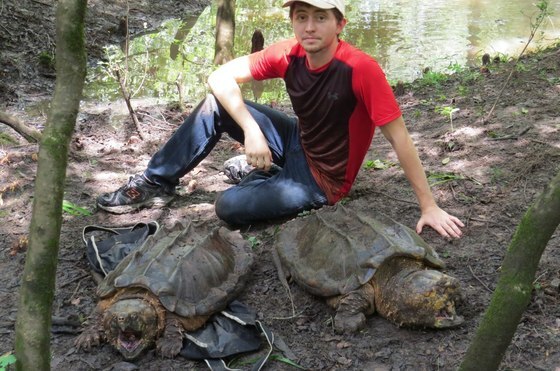 Hoop-trap surveys last month on the Little and the Withlacoochee netted some impressive Suwannee alligator snapping turtles. Captures included a 44-pound female and males of 58 and 80 pounds. A toddler gator snapper – 2.5 pounds and 6 inches long at about 6 years old – was also caught and released. Separate trapping on main river channels landed another five alligator snapping turtles, several other turtle species and even a few large alligators. The gator snappers ranged from 5.5 to 55 pounds. In both trapping efforts, done respectively by Altamaha Environmental Consulting and The Orianne Society, the juveniles indicate reproduction in recent years, a promising sign for these populations. The just-started surveys are part of a two-year project exploring the status and distribution of Suwannee alligator snapping turtles, Macrochelys suwanniensis. This species found in the Suwannee River drainage is one of two gator snappers. Georgia is also home to Macrochelys temminckii in the Apalachicola-Chattahoochee Flint River basin (“Big Turtle Year Turns to Alapaha,” Oct. 7). Alligator snapping turtles are petitioned for Endangered Species Act listing. 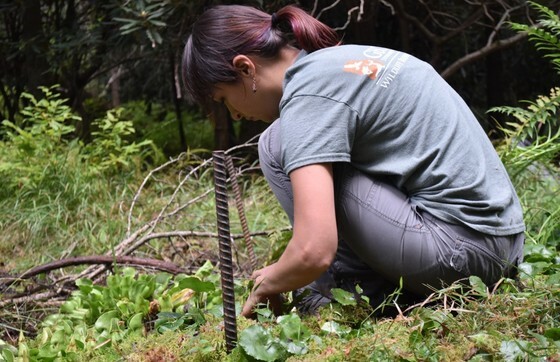 For the Georgia surveys, funded by DNR through a federal grant, traps are set at targeted sites for two consecutive nights. Turtles caught are marked and tagged. Data is recorded on them and the habitat. The same sites will be trapped again next year. North America’s largest freshwater turtles, weighing as much as 200 pounds. The only turtles with an oral predatory lure (video). A conservation priority in Georgia’s State Wildlife Action, a comprehensive strategy for conserving the native wildlife and natural habitats statewide. On Nov. 6, voters will decide the Georgia Outdoor Stewardship Amendment. This constitutional measure, amendment 1 on the general election ballot, has been called a game-changer for conservation. The measure would devote part of the sales tax already collected on outdoor sporting goods to protect Georgia lands and water. The bottom line: Amendment 1 would generate about $20 million a year over the next 10 years for parks, trails, wildlife management areas and for preserving places that are vital to clean water. The money would be dedicated by law to this purpose. The passage of amendment 1 would also affect Georgia’s vibrant outdoor industry, which involves activities from hunting and fishing to hiking and bird watching. Two dates to remember are Oct. 9 (the deadline to register to vote) and Nov. 6 (the general election). Scientists tell us that water covers some 80 percent of the Earth’s surface. With this much water blanketing the globe, it is hard for us Georgians to understand why most backyards are veritable deserts for many wildlife species. However, if you do one thing to help your wildlife neighbors this year, provide them with a birdbath. Although water is arguably more important to wildlife during the summer months, it is a necessity throughout the year. For example, birds need water to drink and bathe. Other animals, like frogs, need it to reproduce. 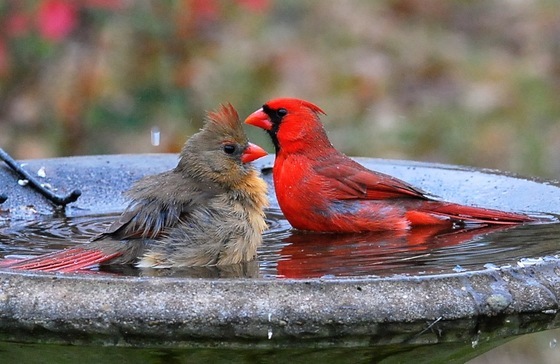 Read Terry’s full column on birdbaths and backyard wildlife. Loggerhead sea turtles continued their nesting comeback in Georgia this summer, if at a slower pace. 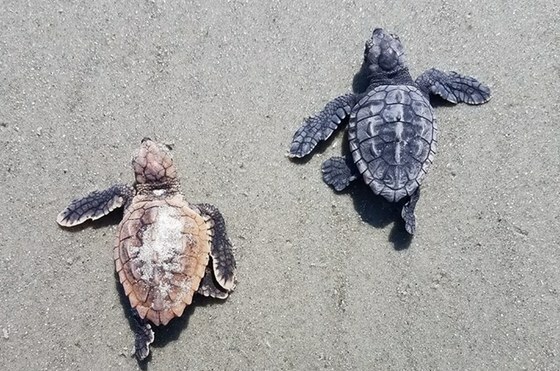 The Georgia Sea Turtle Cooperative reported more than 1,730 nests on barrier island beaches. That topped the annual average – 1,345 – since comprehensive surveys began in 1989. But this was the first sub-2,000 nest season since 2014, eclipsed by last year’s 2,155 and a record 3,289 nests in 2016. DNR Sea Turtle Program Coordinator Mark Dodd noted that fluctuations are the norm and 2018 still added to the threatened species’ recovery. The loggerhead population is growing about 3 percent a year. “Overall, the trend is still good,” Dodd said. This season’s hatch success rate is low, 53 percent vs. the 60 percent average. Factors could include a high, new-moon tide that washed over many nests at mid-season and frequent rains that raised water tables, drowning some embryos. Most nests have hatched, but about 5 percent will hatch as late as early October. Hurricane Florence largely spared Georgia. 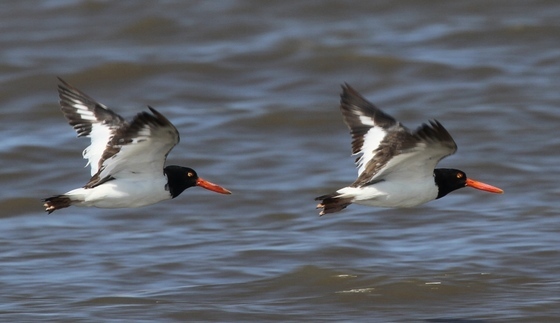 High tides hit some nests, but none were lost. UGA scientists again worked with DNR to expand a growing genetic catalog of loggerheads nesting on Georgia’s coast. The 2008-2018 annual average is 555 females, ranging from 303 to 977 turtles a year. The data is part of a soon-coming population model that will help guide management. Follow nesting news on the Georgia Sea Turtle Cooperative’s Facebook page. Call it the sweet sound of success. On the Chattahoochee National Forest’s Brawley Mountain, a U.S. Forest Service and DNR project restoring bird habitat through timber harvests and prescribed fire produced a stunning moment this spring: Three northern bobwhites were detected. One is calling on this video. These are the first quail documented at Brawley since bird surveys started on the Fannin County property in 2005. 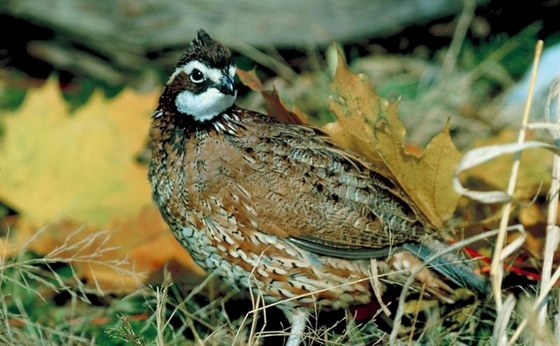 Because of habitat loss, bobwhite quail have been scarce in north Georgia for decades. Senior wildlife biologist Nathan Klaus of the Wildlife Conservation Section said the find shows the resiliency of bird populations and the promise of habitat restoration. Surveys at Brawley also marked surges this year in birds per stop (almost 20), species (16) and diversity, particularly involving in more woodland and early-succession species, groups facing steep declines in the Southeast. DNR senior wildlife biologist Nathan Klaus will receive the Bill Boyer Natural Resource Professional of the Year Award at The Longleaf Alliance’s biennial conference Oct. 23-26 in Alexandria, La. 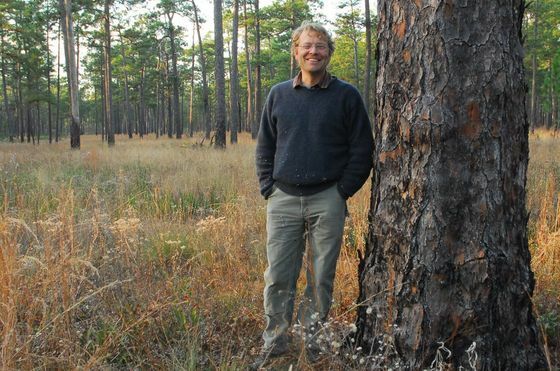 Named for early longleaf and prescribed fire advocate Bill Boyer, the award recognizes a natural resources professional for significant contributions to conserving longleaf pine ecosystems. Klaus, a 19-year DNR employee, has been a leader in restoring longleaf – notably montane longleaf along the Flint River – groundcover (see his brochure on herbicide research) and rare species through prescribed fire, forest management, invasive species control, land acquisitions and landowner partnerships (“Teaming for montane longleaf,” Nov. 25, 2014). Also honored at the Longleaf Alliance conference: The Georgia Sentinel Landscape team has earned the Department of Defense Team Achievement Award, given to a Defense Department group that excels in managing and restoring the longleaf ecosystem on military installations. Georgia’s 20-plus Sentinel Landscape partners include DNR and nine military bases and ranges. 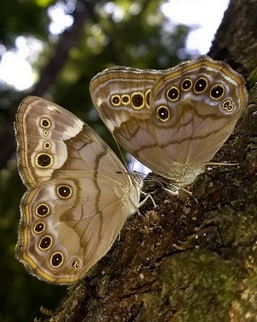 A recent butterfly count that covered the grassland restoration area at Panola Mountain State Park totaled 57 species, the most ever for this section of the North American Butterfly Association count circle encompassing the Arabia Mountain National Heritage Area near Lithonia. Species no. 57, a Byssus skipper, proved the Panola highlight, but sightings including this two-for-one glimpse of southern (left) and northern pearly-eye butterflies were also eye-opening. Wood stork nesting in Georgia declined again this summer with DNR aerial surveys documenting 1,593 nests across 19 Coastal Plain counties. The good news: Georgia's roughly four-year slide from a record 2,932 nests in 2014 has coincided with a range expansion that has more wood storks nesting in the Carolinas and corresponding estimates that the population of North America’s only native stork is increasing in the Southeast. 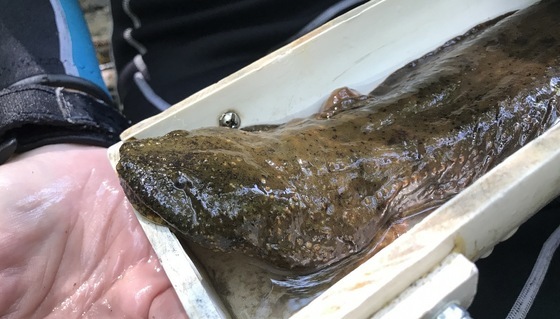 Hellbender surveys last month on select Georgia mountain streams turned up eastern hellbenders large and small. 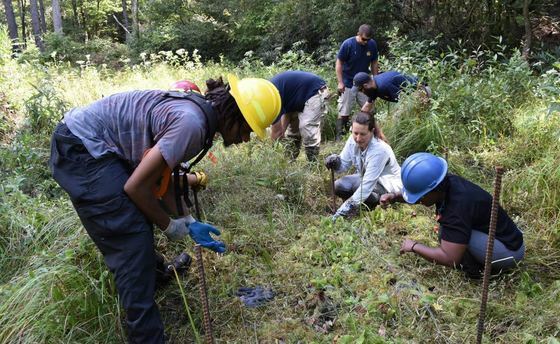 Wildlife Conservation Section staff, helped by partners such as the state Department of Transportation and Georgia Museum of Natural History, sample for the rare salamanders in a subset of streams every three years, building a data set to help monitor populations and habitat conditions. It’s no surprise the supposed sea creature found near Darien this spring was a hoax. What is: That “viral hoaxer” Zardulu, a New York-based artist, was behind what she reportedly said is a jest based on Greek myth, inspired by Darien’s Altamaha-ha sea monster legend and now part of an art exhibit. Photographers have until Oct. 15 to enter the Okefenokee National Wildlife Refuge’s nature photo contest. The winning shot – entries must be taken on the refuge – will be used on the 2019 Okefenokee-specific annual pass. Bats and bridges do mix: The latter serve as roosts, especially in winter. To steer maintenance, repair and replacement work clear of bats, DNR, the Georgia Department of Transportation and the U.S. 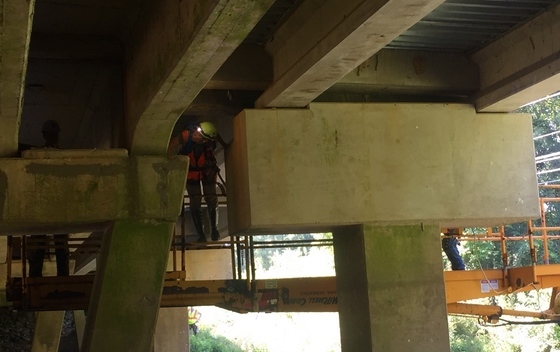 Fish and Wildlife Service are surveying culverts and bridges statewide, like this Chattooga County bridge where 18 big brown bats were found and enough guano to suggest use by a larger maternity colony. A 24-foot-tall chimney swift tower and native plant garden have raised Piedmont Park’s profile as an urban greenspace rich in bird habitat and nature education opportunities. Atlanta Audubon Society unveiled the Exhibitat today. A small crowd in Colquitt welcomed the latest addition to a stewardship project on southwest Georgia's Spring Creek Saturday. Helped by a wildlife viewing grant from DNR and the Georgia Natural Resources Foundation, the Golden Triangle Resource Conservation and Development Council installed signs along a creek-bottom boardwalk profiling species of conservation concern in the area, such as oval pigtoe mussels and American chaffseed. 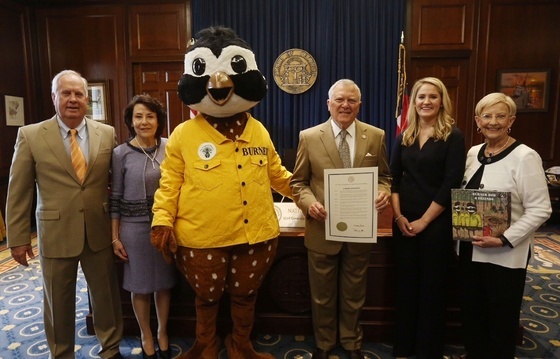 Burner Bob’s calling to promote prescribed fire for healthy longleaf pine forests landed the prescribed fire mascot a state proclamation commending that conservation work. He is pictured at the Georgia Capitol with Gov. Nathan and First Lady Sandra Deal, and creator Reece Thompson and his family. 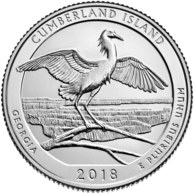 The Georgia state quarter released last month features Cumberland Island National Seashore. The back of the coin (right) depicts a snowy egret ready to fly from a branch near a salt marsh. Names in the news: Jeff Cown will take over for DNR State Parks and Historic Sites Division Director Becky Kelley when she retires next month. Cown worked for 28 years at the state Environmental Protection Division, most recently as Land Protection Branch chief. Kelley's career in preserving Georgia's natural resources spanned 42 years, 16 as parks director. She recently received the Paul Nelson Award for Outdoor Recreation and Preservation. Cpl. Cody Jones of Fannin County is DNR’s 2018 Game Warden of the Year. Game warden 1st Class Quinn Fogle, assigned to Randolph County, received the James R. Darnell Award as runner-up. Eagle Scout Hezekiah Hamblin led a team of volunteers in replacing a damaged walking trail bridge at Charlie Elliott Wildlife Center. Hamblin, of Jasper County, planned the project this summer, with DNR’s Engineering and Construction Team helping him build the bridge. Wildlife Conservation Section senior wildlife biologist John Jensen is one of five authors who recently published research in the Journal of Wildlife Management on head-starting gopher tortoises. The study involved 145 young tortoises released at Yuchi Wildlife Management Area near Waynesboro. Sept. 29 – Bird-banding, 6:15 a.m., Panola Mountain State Park, Stockbridge. Also: 6:20 a.m. Oct. 14, 6:30 a.m. Oct. 20, 5:45 a.m. Nov. 4. Contact Charlie Muise, Georgia Important Bird Areas Program coordinator. "DNR, Ducks Unlimited sign wetlands restoration deal," The Brunswick News. Also: Albany Herald. "Natural Georgia: cicada killers vs. velvet ants." Plus: "Thunderwood to streaked-necks, varied local names for flora, fauna." Savannah Morning News.